Taj Mahal, The world’s wonder of India; is always an amazing idea to trip. Built back in an epic Mughal era with sheer precision, Taj Mahal is the ultimate symbol of love. The Taj Mahal fans have miraculous desires to seek Taj in various phases of a day. As this legend mausoleum creates miracles with the harmony of nature in each phase of a day. The shining white tomb of minaret play magic from shines of the sun. But the trick to catching this treasured gem Taj more magnificently is gazing at it in the midst of glittery shines of the full moon, with a touch of a charismatic peace. So, try to have the glimpse of Taj Mahal in Night. This is the phase of the day when darkness rules over the light to showcase the real spirit of this legend love symbol in just a beam of moonlight and twinkles of stars. 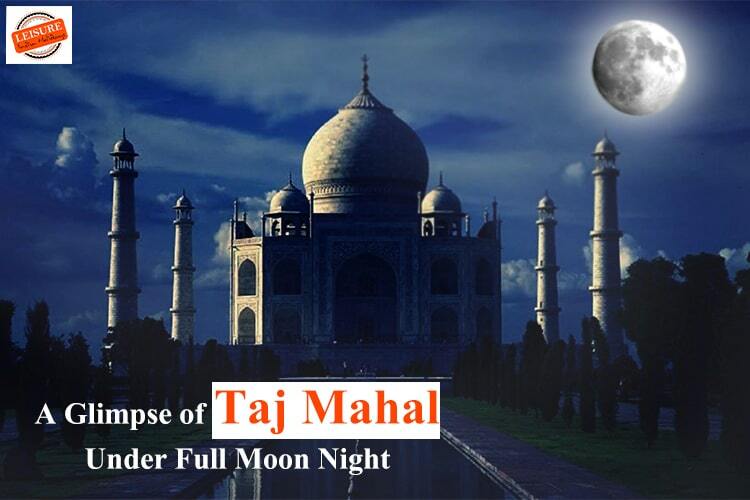 It seems like the full moon is appeared specially for Taj to embellish it, to complement it and to praise its splendor. Catching this exclusive snap of gorgeous Taj Mahal in the night is what a Taj-enthusiast can dream about. Since this appealing love symbol makes good friends with the nights too, to be precise the shining full moon nights. When pious white moonlight washes off this awe-pious palace, this gem truly turns into a pearl. All appears is a miraculous minaret, a full moon, and infinite glittery stars. Taj Mahal is allowed to trip on full moon nights, two nights before and after of full moon night of the months. We have crafted a treat for all Taj lovers by gathering all the essentials of the trip to Taj Mahal in Night at single place. So your Taj Mahal night trip guide goes like this. The trip to Taj Mahal in Night was not allowed until a few years back due to security concerns but in 2004 the Supreme Court of India lifted the 20 year-long bans and allowed for 5 nights in a month i.e. on the full moon night, two days before it and two days after it, except on Fridays or the month of Ramzan. To catch exact dates of Taj Mahal night trips, click on official Taj Mahal site here (www.Taj Mahal.gov.in/faq_taj.html). The night trip is opened for four hours from 8:30 PM to 12:30 AM, for a maximum of 400 people per visit divided into eight batches of 50 people for the duration of 30 minutes. The tickets for the view of Taj Mahal in Night can be purchased one day (24 hours) in advance of the date of night viewing from the booking counter located in the office of the Archeological Survey of India, Agra Circle, 22 The Mall, Agra, in between 10:00 AM to 6:00 PM. Because Tickets have to be purchased one day prior to the day of the visit. For booking tickets, it requires Name of the visitor, its Passport No. its Date of issue, Date of expiry, place of issue, Date of birth, the address of the guest, and Photocopies of passport. The tickets cost Rs 750 (Adult, Foreign), Rs 510 (Adult, Indian), Rs 500 (Child 3-15 years, Foreign & Indian) and it’s a Free Entry for Children below 3 years of age (Indians & Foreigners). The tickets can also be canceled at the above location on the same date of viewing before 1 PM with cancellation charges of 25% per ticket. Visitors need to report at the VIP parking area, Shilpgram of Taj Mahal – half an hour before the scheduled time of visit given in the entrance ticket for security check and briefing. After security check, visitors are taken for dream come true night, Taj Mahal visit in a battery operated the bus. The soul-stirring moonlight glimpse of Taj Mahal is allowed to catch from nearby red sandstone platform only, which is approx 500m away from the mausoleum, as per the rule. Video Cameras, bags & Mobiles are not allowed during the visit while still cameras and binoculars are allowed to capture night shots of Taj Mahal. 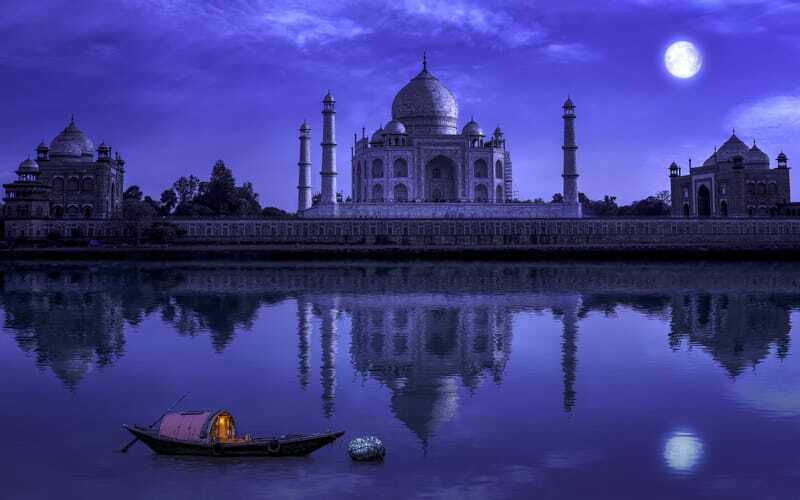 It is advisable to plan the trip of Taj Mahal in Night during months of summer. Because in winters fog and chill can hinder in viewing the magical night glimpses of Taj Mahal. Also On the ticket, it is mentioned the “tour” will be canceled if the weather doesn’t permit. So it will be a good idea to come to see Taj Mahal in gentle weather nights during the months March to November. Yes, it is a fact that there exist various not so good things about this magical night trip of Taj Mahal. Short 30 minutes duration, 500m away viewing, non-allowance of video cameras and tripods, and doubt about the cancellation of this trip. But still something is better than nothing and if that something is a world wonder, Taj Mahal, then no double thought about any aspect is allowed for a Taj Mahal enthusiast. Because it’s a priceless experience that any Taj Mahal lover can live, it’s a golden opportunity to catch the sights of this love minaret in golden lights of full moon and stars. Hence Book your moment to sight “The knight in shining armor”. Because here your knight is the majestic “Taj Mahal” itself wearing shining armor of glittering full moonlight. Taj Mahal in Night is full of surprises.